At the age of 27, I lost 100 pounds. Since then, I waited to have the courage to get a tummy tuck and breast lift. When I walked into Cosmeticare I felt comfortable immediately. 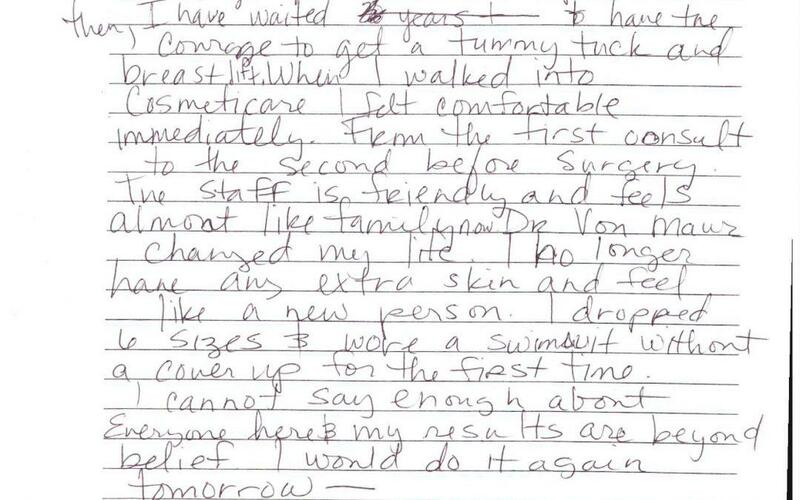 From the first consult to the second before sugery. The staff is friendly and feels almost like family now. Dr. Von Maur changed my life. I no longer have any extra skin and feel like a new person. I dropped 6 sizes and wore a swimsuit without a cover up for the first time. I cannot say enough about everyone here and my results are beyond belief. I would do it again tomorrow.